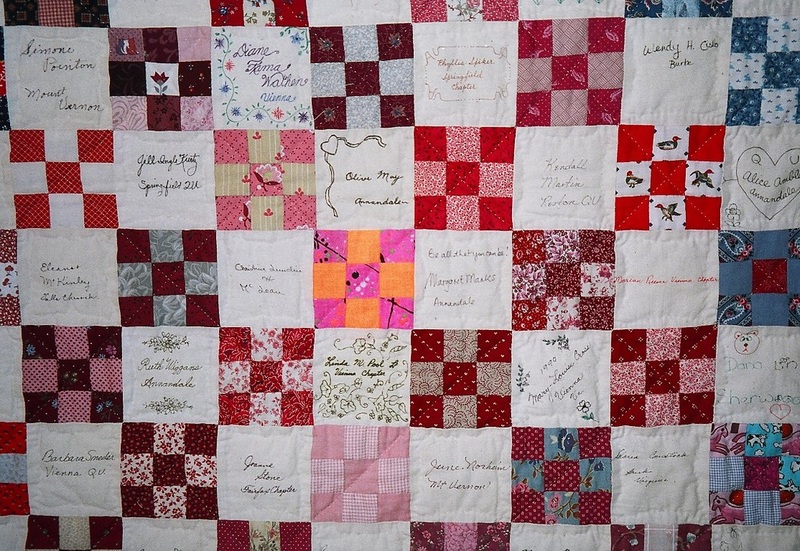 Several quilts in my collection were made with contributions from friends between 1987 and 2000. 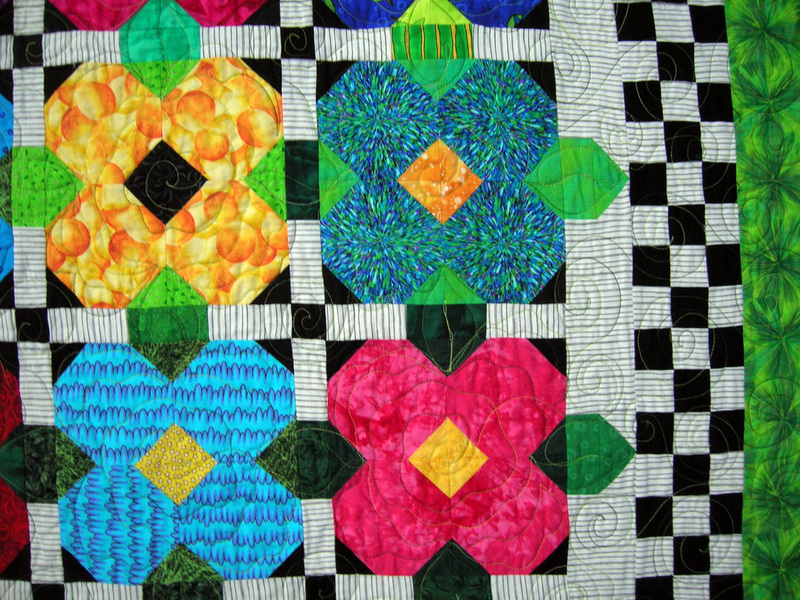 Without the support of my quilting community I would not have enjoyed this hobby as much as I continue to do. These are among my most favorite friends. 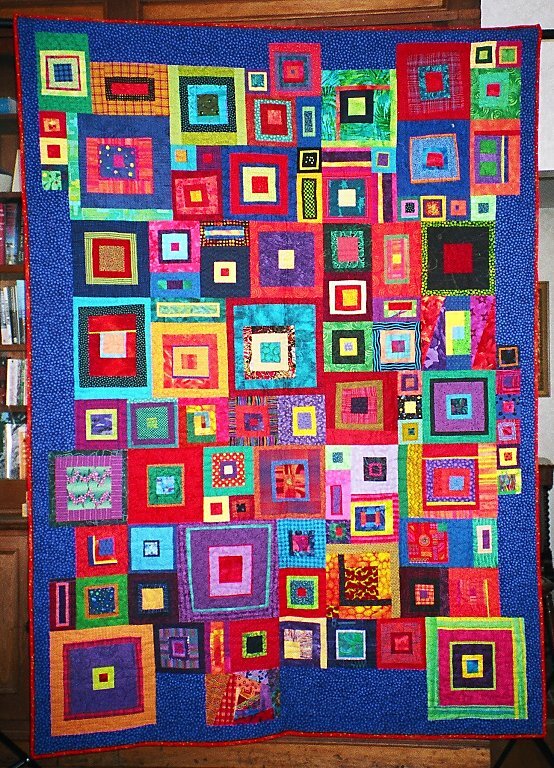 This quilt was made using blocks from friends I worked with at the Quilt Patch in Fairfax, VA. 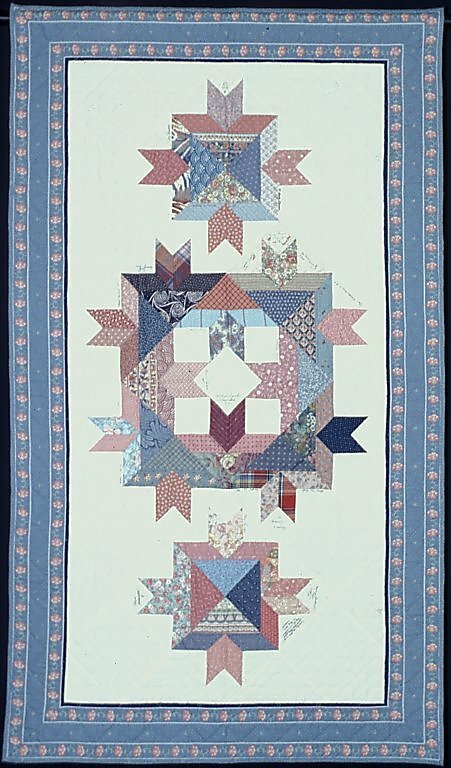 I used this quilt for many years in a class I taught in Quilt Sets. 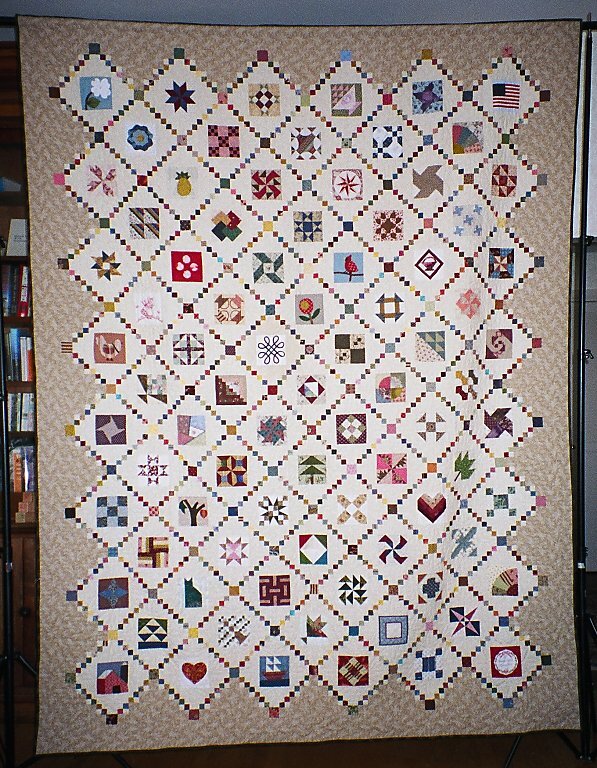 This quilt was my first original design that I came up with after visiting a quilt show in Kalona, Iowa, the year before. 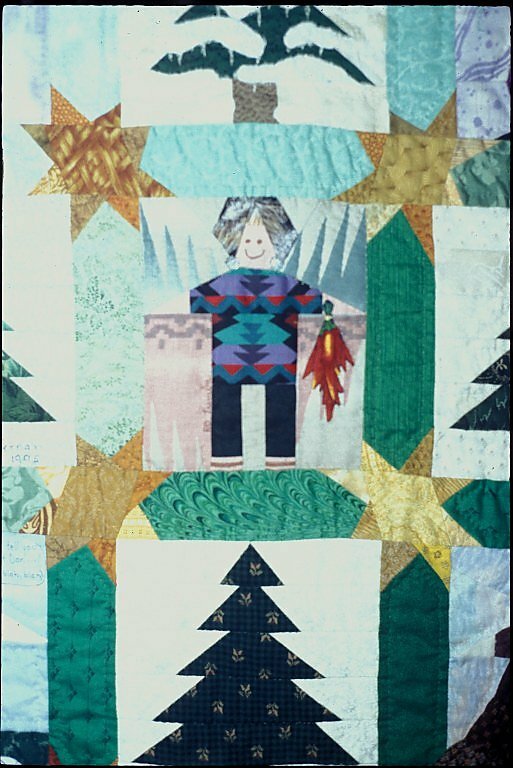 The staff Christmas party at the Quilt Patch that year included a block design we were each to make. One person won that set of blocks. We enjoyed the project so much we continued on a monthly basis until we each had had a set of blocks. I contributed this barn block to the drawing but did not win them. 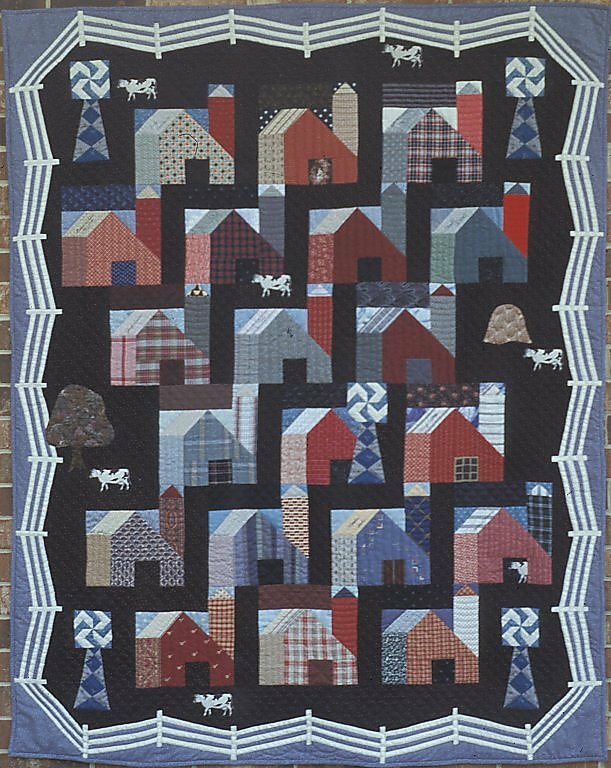 I then taught a class in the barn block and used fabric from the different students to make this collection of barns. The set is also original. It is the custom in the Annandale Chapter of Quilter’s Unlimited to give the outgoing president a basket of fabrics. The colored fabrics are from them in 1989. I used a pattern that was originally popular in Annandale when the chapter was formed about 1975. 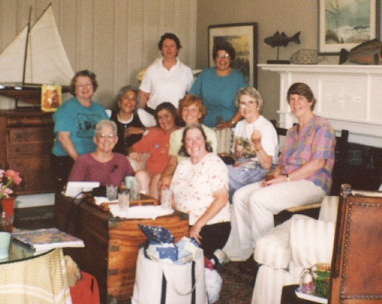 I was president of our local quilt guild, Quilter’s Unlimited, between 1989-90. I was presented with hundreds of small nine patch blocks with the accompanying signature blocks. I was thrilled! 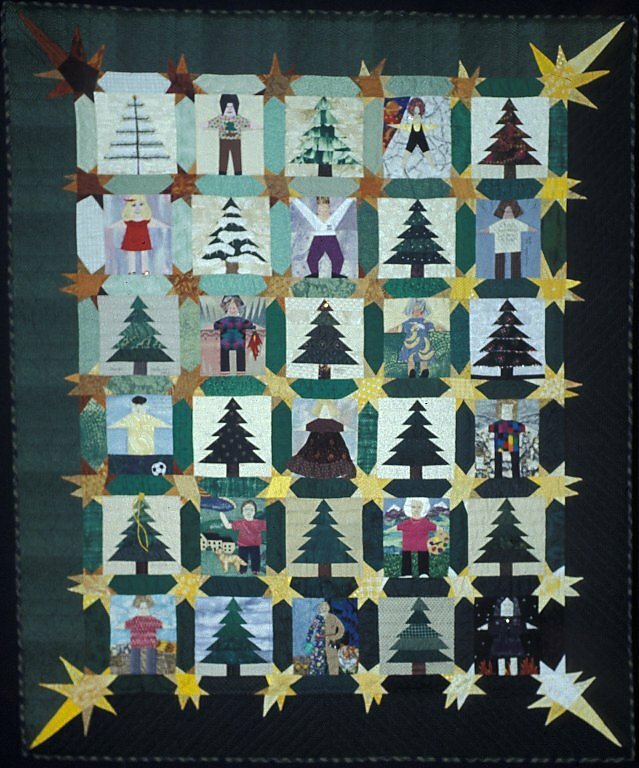 The executive board of Quilter's Unlimited (1989-90 - the year I was president) came up with a group project involving all ten chapters that would result in an educational quilt that could be used in the schools. 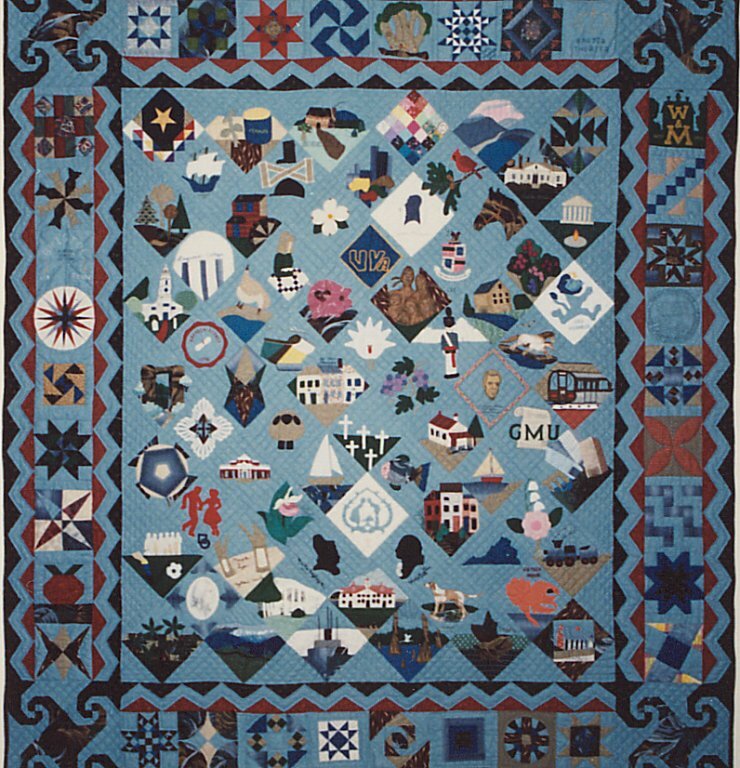 This quilt, featuring patterns representing the state of Virginia, is the result of the efforts of dozens of members. 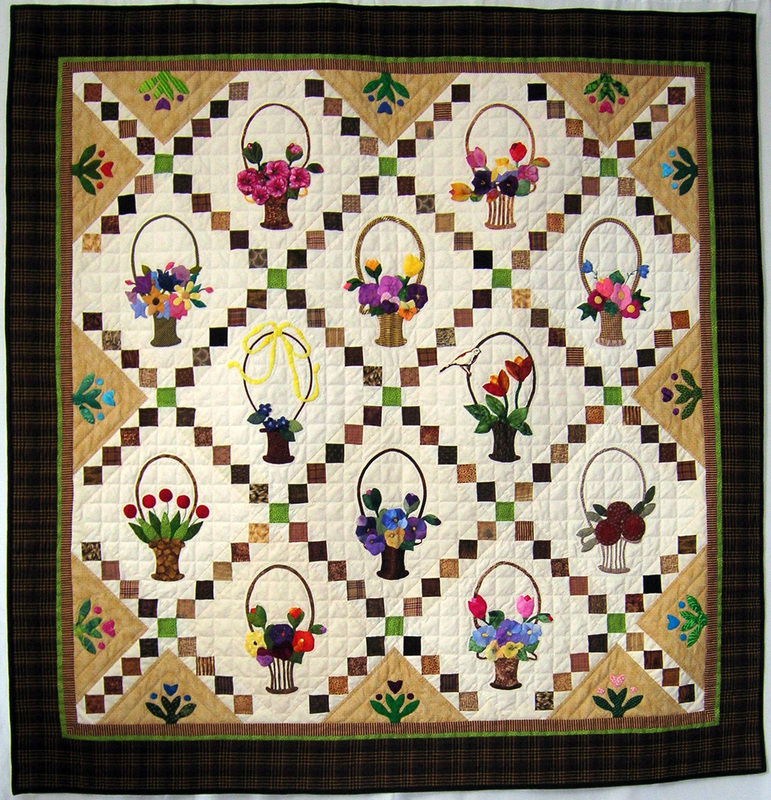 Another member, Barbara Bockman, and I wrote a pattern book to accompany the quilt. A copy of the book was given to all elementary schools in the county. 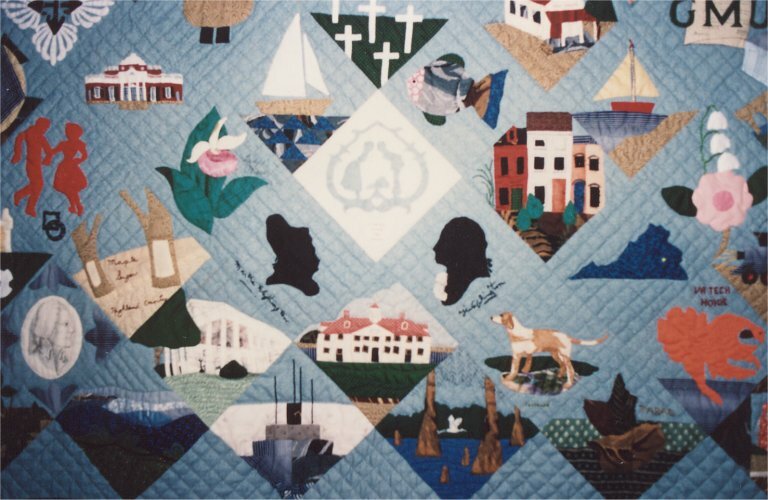 The quilt has since been given to the Virginia Quilt Museum, and appears in the book, Virginia Quilt Museum, by Joan Knight. 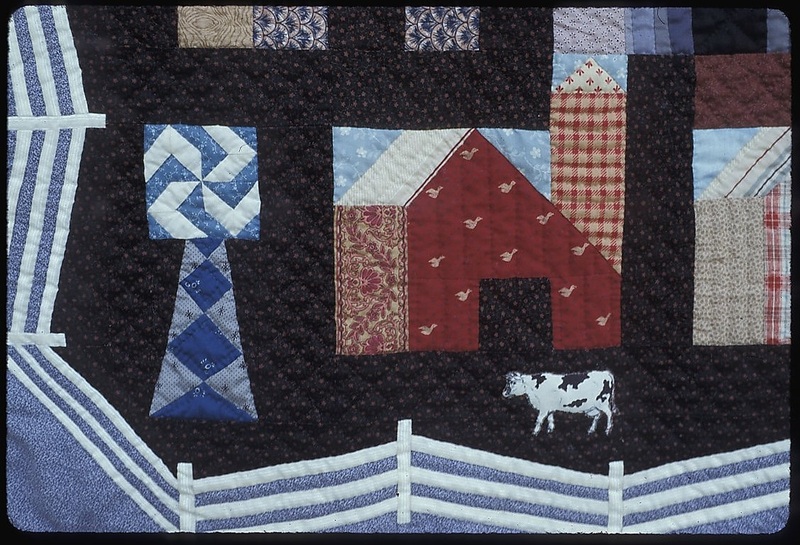 The theme was purple cows and my Dirty Dozen quilting bee was asked to make a block that coordinated with that theme. 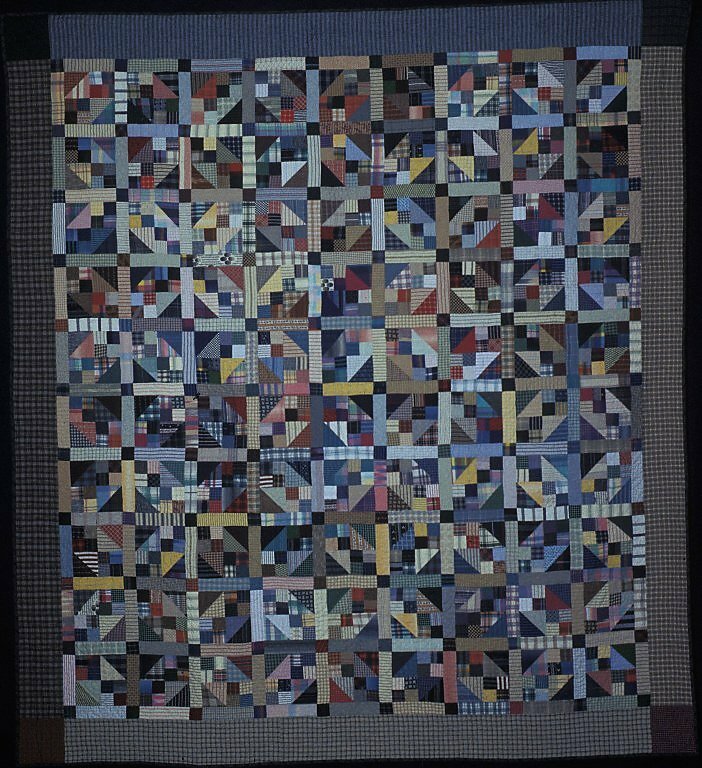 This is one of my favorite quilts and plays an important role in my lecture on Quilt Sets. 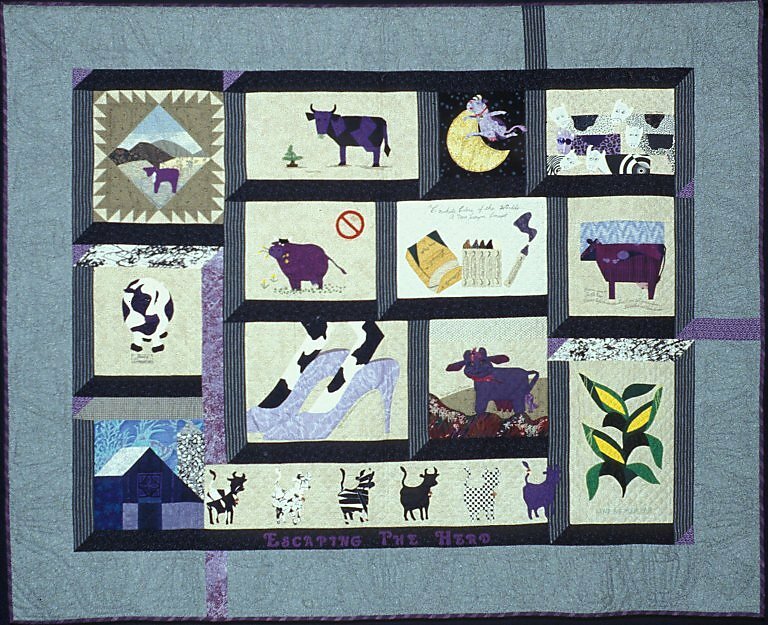 My friend, Pat Gallagher, designed the block with the purple cow escaping the herd - thus the title. 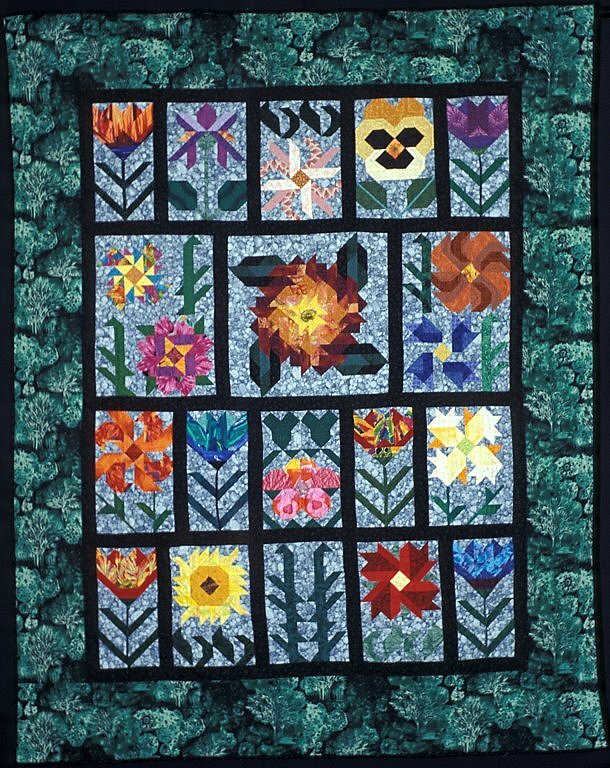 The patterns for this quilt are from the book, Fantasy Flowers, by DC Burbank. Bright fabrics were becoming popular at the time and I asked my friends in the Dirty Dozen to each make a flower using something bright and cheerful. I provided the background fabric. 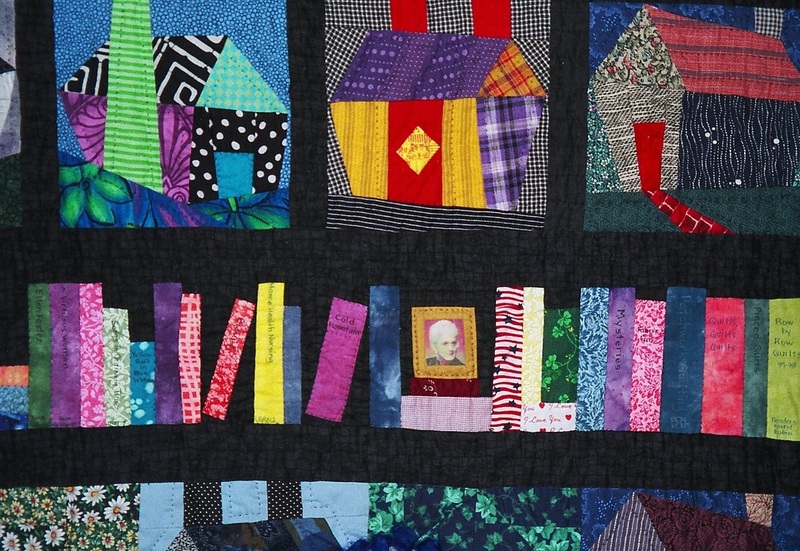 This is the result of a quilt retreat with the Annandale chapter of QU. 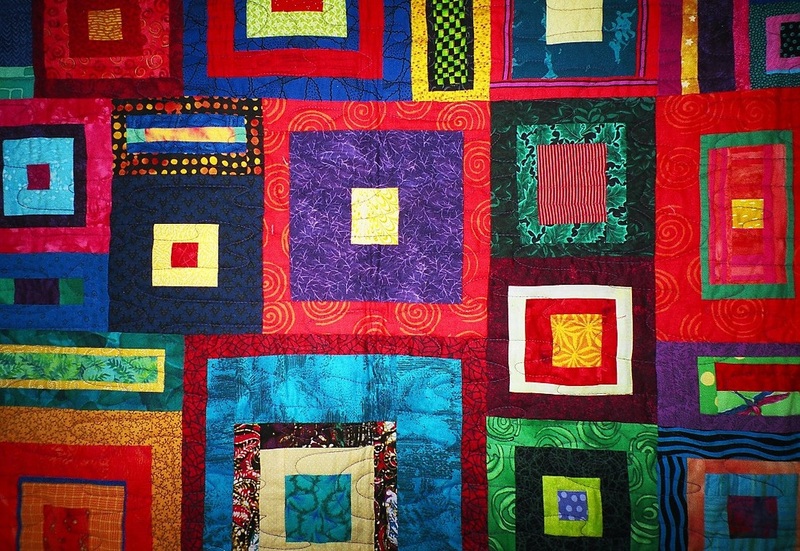 We all cut strips and squares of stripes and plaids and then exchanged fabrics and made our own quilts. The ASAP stands for Annandale Stripes and Plaids. 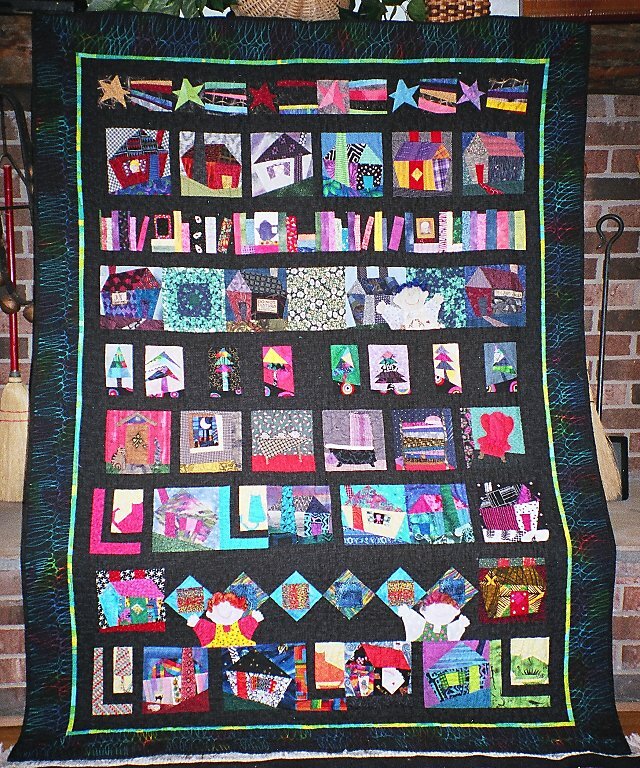 This quilt combines blocks from the staff at the Quilt Patch with self portraits of friends in my Dirty Dozen quilting bee. Sets are a big interest of mine and since the two sets of blocks were different sizes, some thought went into this. 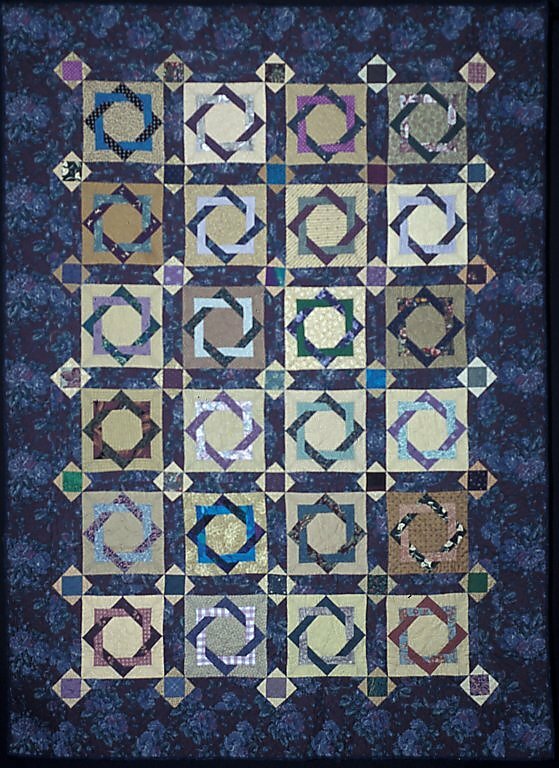 The blocks for this row by row quilt were made by friends from my online book club, the YoYo Sisters, and friends from the Dirty Dozen. I made the row of off kilter houses and had great fun figuring out how to set all those units together. A group of eight friends who worked at the Quilt Patch exchanged blocks at 6 six-week intervals. We would make eight identical blocks, keep one and give one to each of the others in the group. What fun it was! This is the result of a group project with my Dirty Dozen friends. About eight of us were involved. At first I had the units arranged into a rectangle, but decided to move some of the units into the border for interest. We were inspired by the cover of the Kaffe Fassett book, Glorious Patchwork, but came up with our own way to make the blocks. 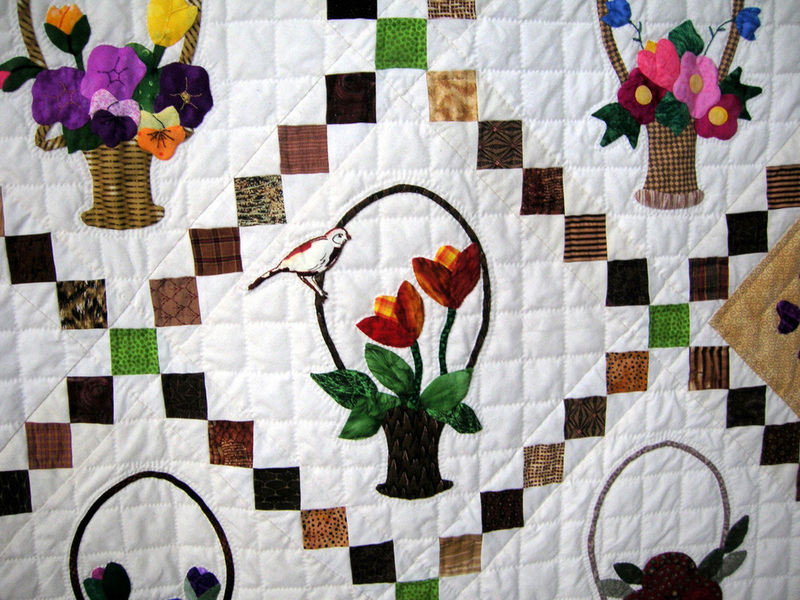 Machine quilted by Kathy Gray. Another stash user!!! 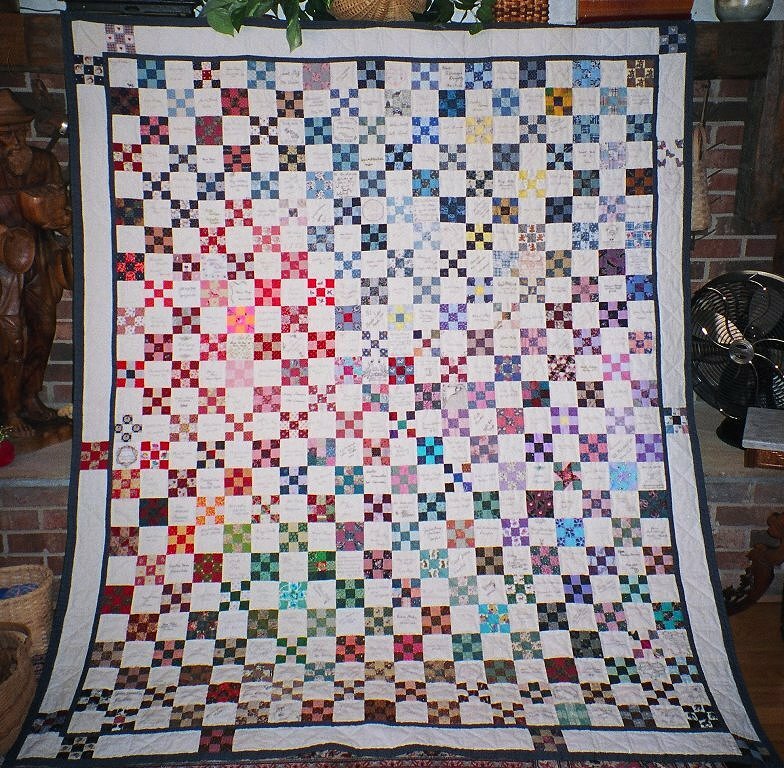 One of my favorite quilting bees is the Dirty Dozen. We are allowed to request a block when it is our month to hostess. I selected this flower block and about 10 of them are from members of the group. They combined well with a great black and white stripe I wanted to use. 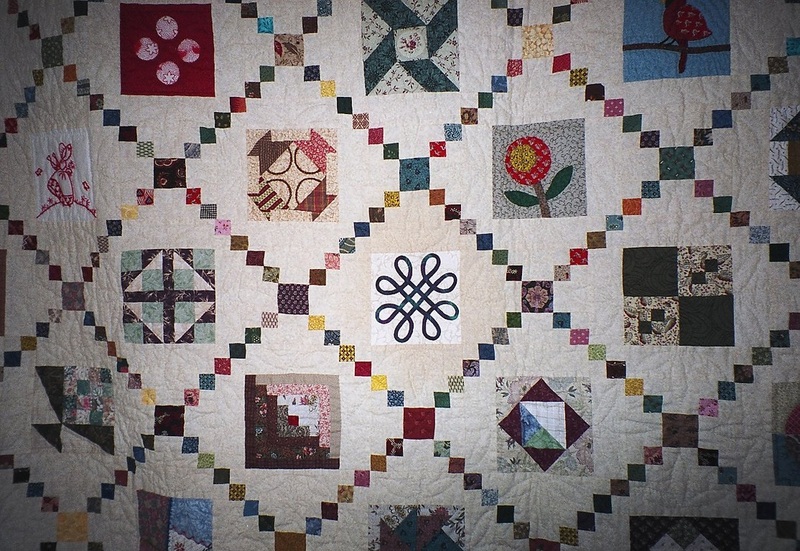 The green outside border fabric is the only one purchased for the quilt. 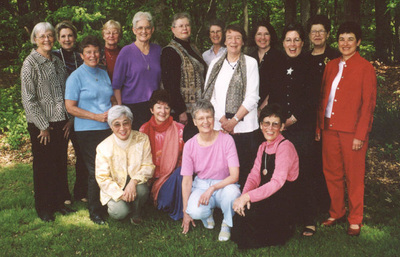 The Old Dominion Appliqué Society meets monthly in the area. 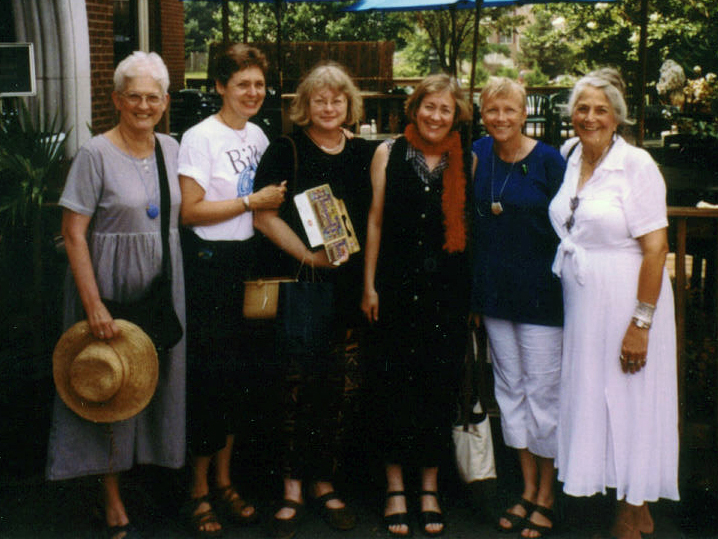 In 2005 members were asked to make a 9 ½” (finished size) basket block similar to a pattern that was distributed. I was the lucky winner of nine blocks. There was an exchange of nine patch blocks in McLean QU. 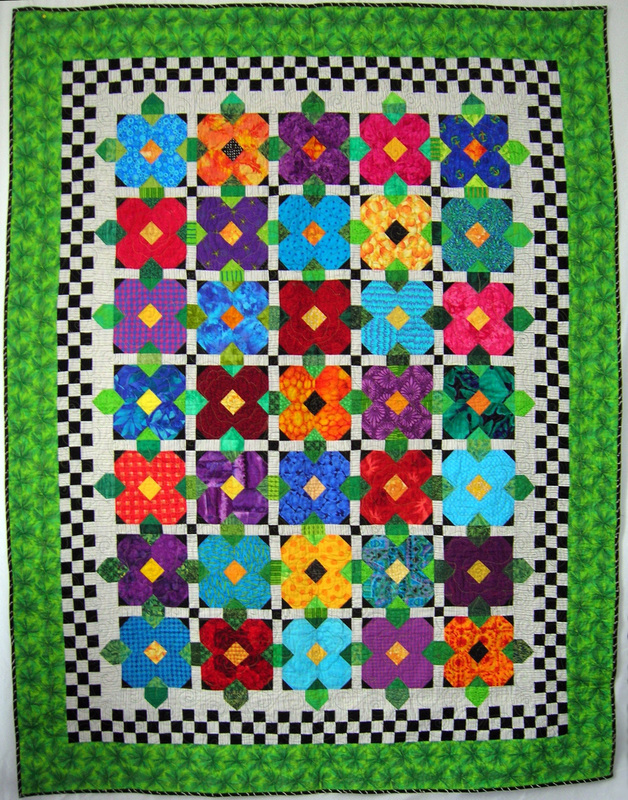 Both quilts were made by me using sets I particularly like and fabrics in my stash.